In this February photo, Qigiq's injured left wing is immobilized with a splint while it's healing. The bird is now at the Alaska Raptor Center in Sitka and is expected to be released in the wild after further rehabilitation. 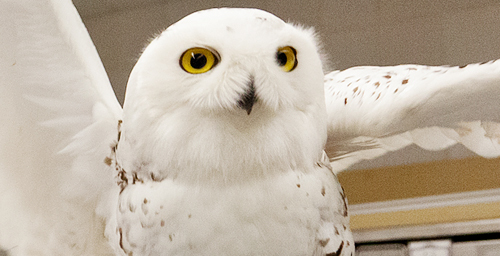 By now, Qigiq - pronounced KWIG-ick - should be settling in at the Alaska Raptor Center, in Sitka, which has had success rehabilitating and releasing snowy owls. Qigiq's recovery has been remarkable, according to the clinic's medical director, Dr. Julia Whittington. She spoke with a number of raptor centers seeking the best "next step" in the owl's care: the kind of wildlife rehabilitation that prepares animals to re-enter the wild once their medical problems have been resolved. "In Alaska, he will enter 'basic training' for return to the wild," Whittington said. "They are getting their eagle flight cage ready for him." Whittington said she was not hopeful initially that the owl would be releasable because of the critical condition he was in when he arrived - very emaciated and weak - and because of the location of the fracture. Two surgeries were required to repair the break. "Against all odds, this snowy has recovered to the point where he can begin rehabilitation in preparation to be released to the wild," she said, noting her tremendous pride in the work of clinic volunteers. Whittington especially credits the intensive care the bird received in his first days at the Wildlife Medical Clinic, when veterinary student and ward co-manager Anne Rivas worked diligently to improve his overall condition before the fracture could even be addressed. Later Kim Knap, a rehabilitation therapist at the Veterinary Teaching Hospital, was instrumental in restoring critical wing extension that was lost as a result of the owl's extensive injuries. "He grumbled about his physical therapy treatments just like anyone undergoing physical therapy," Whittington said, "but this was an important component of his care because of the extent of the damage to his muscles and tendons." Knap, whose patients more frequently are dogs and cats, administered both cold laser therapy, to promote bone healing, and ultrasound therapy, to improve elasticity of the tendons, for the owl. The cost of the owl's care to date is more than $3,700. The clinic is a non-profit organization, supported solely by private donations.